Brighton & Hove Albion boss Chris Hughton has revealed he has never been too concerned with his side's unenviable away record in the Premier League. The Seagulls' 1-0 victory at Newcastle United on Saturday was their first win in five attempts on the road this season - their first away win for 18 games. Last season, Albion managed just two away successes in 19 games as they achieved a 15th-place finish thanks to their impressive home form. And as Hughton bids to keep his side in the Premier League for a second successive season, he has admits he doesn't mind where the points come, just as long as they come. On picking up away wins, Hughton said: "I've made less of it than others have. If you guaranteed me we'd pick up enough points in a season to finish in a decent position and not do well away form home then I'd settle for that. "It's harder for teams like ourselves away from home, what pleased me most is the manner how we did it we had to run, get tackles in, graft and we needed the goalkeeper to play well." 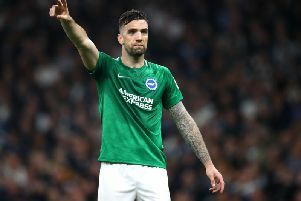 Beram Kayal's fortunate 29th-minute strike made it two wins in two for Albion - and Hughton was also impressed in the part centre-back Lewis Dunk and Shane Duffy played. He commented: "The two centre backs were outstanding and we needed that type of performance to get the win. That's what pleased me most." The Albion boss also stressed the importance of registering their second straight clean sheet - their only two of the season so far. Hughton revealed: "We spoke about it before the West Ham United game, we needed to try to get back to clean sheets, because in my time here that's been the basis of what we do. "We've got more offensive options and quality than we have had but it's hard in this division to keep an away clean sheet. It's really pleasing."